The second generation of UNP leaders, including it’s Deputy Leader Sajith Premadasa will have to wait for another 11 years to get hold of the reigns of the party from its current Leader Prime Minister Ranil Wickremesinghe, MP Susil Premajayantha said today. 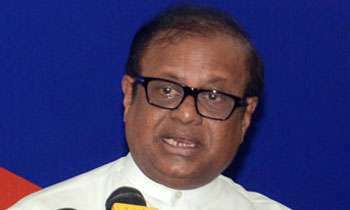 Speaking at a news conference of the Sri Lanka Podujana Peramuna (SLPP), he commented on PM Wickremesinghe’s speech made at the UNP’s 72nd Convention held recently. Why are you worried about the UNP, try to find a party for you to get a ministry. He presently enjoys the political life that is gifted by MR regime not by knocked-out UNP fellows. suSIL can now got to his home country like baSIL to America where he is a citizen . NEWS TO ME - so he is also an americano - and these fellows get ministrial posts . See dirty patrol's knowledge in arithmetic ! We studied about crocodile tears way back in nursery class. Now we see the two legged crocodile mired in dirty petrol shedding tears for his unrelated foes. And you guys will have to wait like 'forever'! As a JO leader I wonder how long you will have to wait.. no matter who comes next time. What about you "criers"? It seems, none of you ever!!! Leadership and Power are the monopoly of Rajapakses'! Do not worry about UNP, worry about your own party. How long are the non Rajapakse members going to wait to take over the leadership? 100 years? Why do you care? What's the hurry?